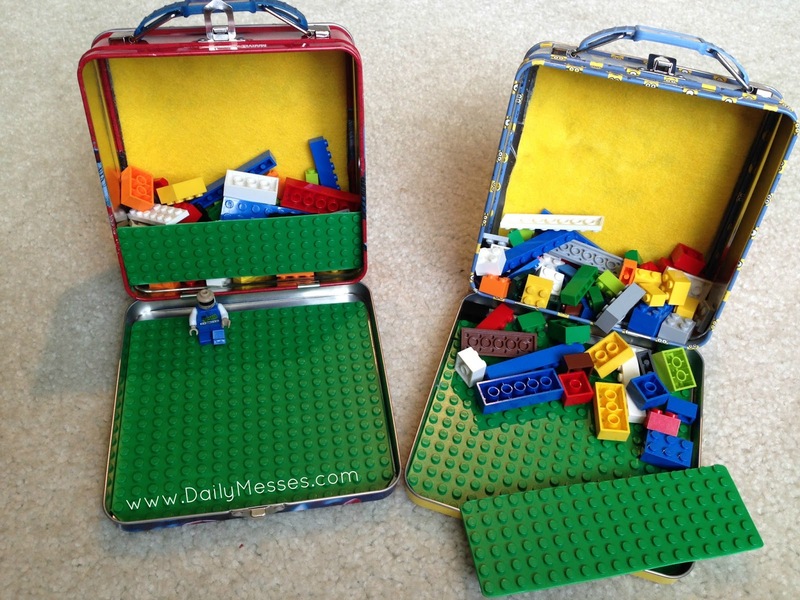 Daily Messes: Legos To Go! I saw this on Pinterest and had to try it! 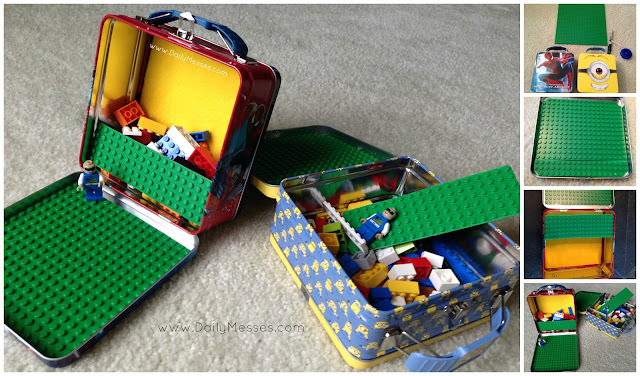 The boys love Lego's and want to bring them in the car, whether we are going on a 10 minute drive to Grandma's or on vacation. I thought this would be the perfect solution. It would also make a really cute gift for someone! Measure the inside of the lunch box lid. Find or cut a piece of Lego board to fit in the lid of the lunch box. I cut a piece from a larger 10x10 board. I thought I could get two full pieces out of the larger piece, but measured wrong. I ended up with 1 full board and then had to piece two other pieces together to make the second board. Once they were glued down, you could see a slight line, but still completely playable! With my lunch boxes, I probably could have just used a 5x5 Lego square. DM Tip: Before you glue, place the lid flat on a surface with the board laying in it. Try to close the box. I had to trim an extra row off of the board to make sure the lid would close because of the slight lip on the box. If there are sharp edges from cutting, use sandpaper to file down. This was actually a lot easier to do than I thought it would be. Be careful of any surrounding Lego dots on the board, as they file down really easily too! Glue or use Mounting Squares to attach Lego board to the lid. Optional: Cut a piece of felt to fit in the bottom of the lunch box. You can skip this part, but the boxes will be a little noisier. :) Glue down. Optional: If you have any Lego pieces left over, you can cut a piece the length of the box. Sand any edges. Place on top of the Legos. (You may have to bend slightly to get in the box.) If you carefully turn upright, it can act as a barrier and keep the Lego bricks from falling everywhere while playing (as seen in picture). It can also act as an extra building plate! **You could also use a small Rubbermaid type of container, a baby wipe container, pencil box, or a bead/loom band sorter plastic box and glue the board on top! Traveling With Kids, tips and ideas for surviving trips with your kids. I thought I could get two full pieces out of the larger piece, but measured wrong. I ended up with 1 full board and then had to piece two other pieces together to make the second board.